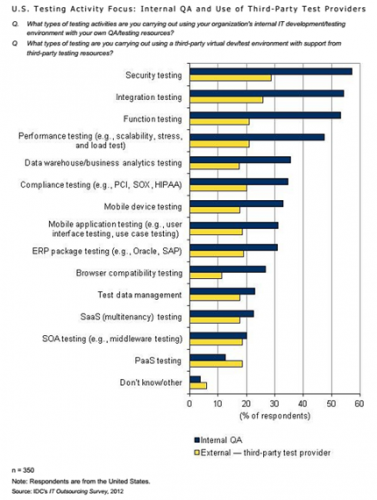 Why Independent Software Testing ? The aforementioned statements by world renowned analysts make it amply obvious as to why is independent software testing becoming a necessity – and to the growth that can be foreseen in the arena. To carve a niche in their chosen arena, independent pure-play testing service providers need to cover multiple industries and multiple technologies – with testing services as their key offering. Focus must be on the deliverance of the complete set of activities that entail the standard testing lifecycle – not on competing or interfering with other IT services providers engaged in application development or maintenance services. Focused independent pure-play testing service providers – be they of any size – always add value to clients. Such flexible providers are usually armed with a combination of skill sets that may fit both small and large (country-/industry-specific) projects, and thus can work on deals cutting across a wide range. The predicted spending for discrete enterprise application testing services for Americas region is estimated to grow to nearly $15 billion in 2017, while the EMEA and APAC regions are estimated to reach $11.5 billion and $2.5 billion, respectively, in 2017. The predicted spending for discrete product engineering testing services for Americas region is estimated to grow to nearly $1.9 billion in 2017, while the EMEA and APAC regions are estimated to reach $0.8 billion and $0.5 billion, respectively, in 2017. Per IDC’s IT Outsourcing Survey, service providers are being used for a variety of testing services with highest adoption for meeting requirements like security, integration function, and performance testing. 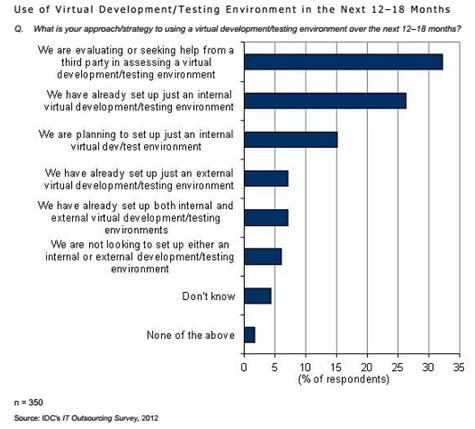 According to IDC’s IT Outsourcing Survey, nearly 88% of buyers are using a virtual development/testing environment, either internally or externally, or some combination of both.